Many people are turned off by DIY projects because they imagine it will take a lot of time, require a lot of skill, and often cost more money after you buy the necessary tools and equipment. But when it comes to making your own granite cleaner, nothing could be simpler. Instead of paying upwards of ten dollars for a 12 oz. bottle of granite cleaner, you can make your own with regular household ingredients for a mere fraction of the price! Granite is a very durable stone that can weather almost any force and element. After all, it is forged in the crust of the earth for thousands of years. But we love the granite in our homes not just because it is tough and hardy, but for its beauty as well. Granite is sealed with a special coating to keep it lustrous and glossy, and many household cleaners can damage that sealant, leaving your granite vulnerable to scuffs and streaks. 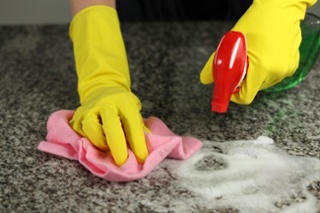 Acidic solvents, such as vinegar- or acid-based cleaners can cause unsightly “etching” on granite countertops. Similarly, Windex and other multi-surface and glass cleaners can strip the sealant right off your stone. So, when cleaning the granite around your house, it is absolutely crucial you use a solution that is safe for natural stone countertops. Actually, it’s not so secret. 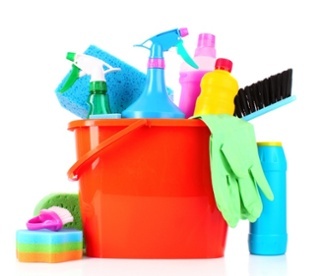 Most granite cleaners contain the same basic ingredients: dishwashing detergent, essential oil, water, and one final, key ingredient: rubbing alcohol. In fact, any neutral, high-proof alcohol such as vodka or everclear will work just as well. Thinking about adding Granite to your home? It’s important to pick a company that really takes responsibility for the care and production of their product and what they do. As one of Chicagoland’s leaders in natural stone fabrication and installation, Granite Selection employees pride themselves on their work and only use stones they would be proud to up into our own homes. Visit https://graniteselection.com/ to schedule a free in-home measurement service with one of our granite specialists.